As I was leaving my last fourth grade class for the day this afternoon at the school where I’m teaching this week I heard a boy behind me call out, “Thanks for an exciting class!” Great feedback for a teacher of any age level. Exciting classes hold students’ attention. Meet a new member of the “attention-ology team” – Little Orphan Octopus (LOO). "Little Orphan Octopus" loves little kids! Check out those big eyes in my blog pic above and you’ll see why children in grades K – 2 will be happy to have LOO join the class! I found Little Orphan Octopus for a buck in the dollar section of a Target store. If you have trouble getting your hands on a soft stuffed octopus, select another stuffed creature and put it to work in similar multi-faceted ways. Choose from the following eight ideas – Little Orphan Octopus thinks the number eight is great because – you guessed it – he has eight legs! 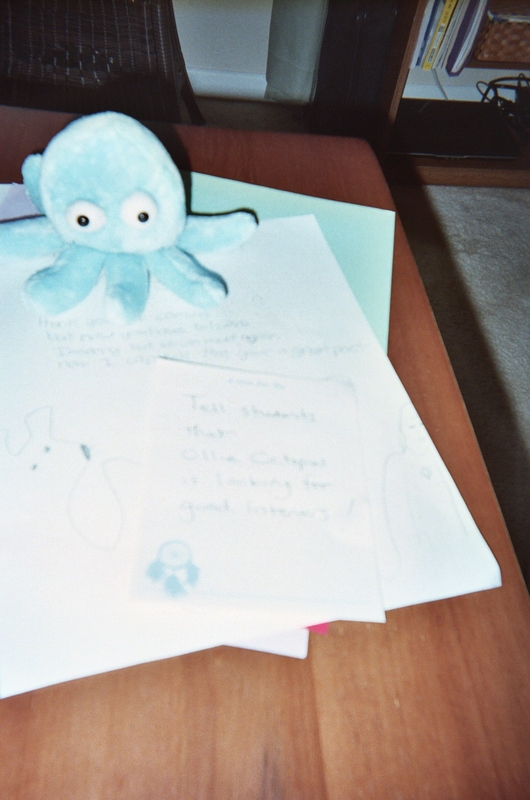 Introduce Little Orphan Octopus to your class – Make up a story when you first make a home in class for LOO. Hold LOO up for all to see and tell your students that you found him hiding in the seaweed of a fish tank at a pet store near you. Explain that you’re pretty sure that LOO is an orphan because he was the only octopus in the tank. Tell the kids that LOO seems happy to be a new member of class and ask if they have ideas for how to welcome him further. Invite storytelling with LOO – Tell your students that you’re also sure that LOO likes stories because his legs began to dance (make LOO’s legs “dance”) when you started telling him about your class. Encourage the class to write stories for LOO. Reading Time with LOO – Students may “borrow” LOO to take with them to a quiet reading spot in the classroom. When students are reading at their individual desks or tables you can reward good readers by placing LOO on the edge of their desks. Where’s Little Orphan Octopus? – Help your students develop strong observation skills by “hiding” LOO in plain sight on a regularly scheduled basis, like every Friday morning. The first student to spy LOO gets to keep him on her or his desk for a period of time. Let’s Get a Leg Up on Learning! – With eight great legs, LOO is a model addition to class. Why not designate each leg as a symbol of learning. Once again, hold LOO up for all to see and explain that LOO loves to jump into learning with all legs – one leg for math, one for reading, one for writing…you get the idea! Let LOO in on Science Adventures – Explain to your class that LOO is a creature of the sea. You can expand on this identification with an actual science lesson if sea life is part of your curriculum. If your students are learning about other areas of science for the early grades show them that LOO wants to be in on the adventures. LOO likes to wrap himself around fun science facts! LOO Likes Respectful Students – You likely have a poster on a classroom wall that lists your expectations of students, including showing respect for others. Draw greater attention to the poster by inviting students to bring LOO up to it, one at a time and point with one of LOO’s legs to the “rule” that student thinks is most important. This opens up opportunity for class discussion in a fun, friendly way. Make a Bulletin Board for LOO – Get the whole class involved in drawing, coloring and cutting out sea forms to post on a bulletin board. Explain that this will help Little Orphan Octopus feel at home in school. If you want to go to the trouble, you can add a three-dimensional piece that can be attached to the bulletin board, a kind of “throne” for LOO to sit on when he’s not busy elsewhere in your room!